This review is my first foray into a Sub Ohm Tank review, with the new Geek Vape Griffin 25 Rebuildable Tank Atomizer with top airflow provided by the awesome folks over at Efun top. For only $26.99 (at the time of this writing) it is a fairly affordable tank. You can get it directly from here. Buy for $26.99 – Same version reviewed, Ships from China. So just what do you get when you invest in the Griffin 25 RTA? For starters, the packaging is a transparent, plastic box with a foam liner and cardboard side panel that acts as a cover for all the bits and pieces that come with the RTA. 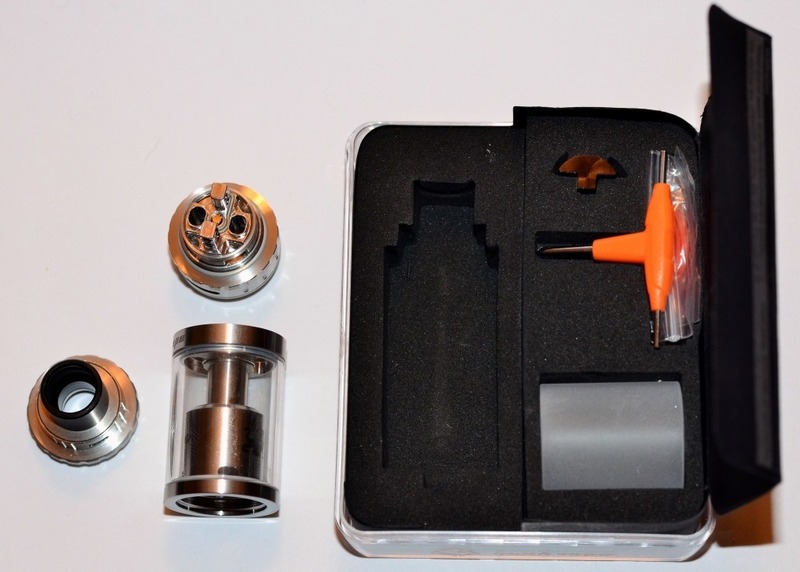 The tank comes assembled, and the wide bore drip tip is pre-installed, but you will still need to build a coil on it, as it doesn’t include one. Underneath the side panel is where you will find all the goodies, including a frosted glass replacement tank section, a special tool for the allen screws used in the velocity style build deck, a spare bag of parts that has replacement seals, O-rings, single coil adapter, and a 510 drip tip adapter to use with a standard drip tip. I was sent the Top airflow version of the Griffin 25, which “looks” virtually identical to the standard version except for the inclusion of a different top cap that has an airflow adjuster ring on it. I quoted the word “looks” because the changes are actually a little more substantial than they seem. These changes include a slightly shorter overall height than the non airflow version, the top airflow adjustment ring, some seals and a double walled chimney that allows for the airflow from the top. Overall though, I was hard pressed to see the difference in a side by side comparison with the standard version at one of the local brick and mortar shops that I frequent. Straight out of the box, this RTA feels solid and well built. If you are used to the standard 3-4ml subtanks, then with a capacity of 6ml, the Griffin 25 is going to feel HUGE. This thing does hold a lot of juice. Overall, when using the Griffen 25 RTA it really isn’t as big as it seems, especially if you have a mod with a 30mm build deck to put it on. It is, however, large enough and heavy enough to make a smaller mod very top heavy and potentially fall over easily from the additional weight. At 25 mm, the Griffin 25 RTA will overhang off the edges of most single 18650 battery mods. For the new breed of 26650 mods that is hitting the streets now, it probably fits really well and will look pretty amazing on some of them. Ultimately, if you are like me and don’t like tanks that overhang the top deck of your mod, then you need to be prepared to buy another mod to go with it. The extra large drip tip seems to help with airflow, but I am very happy that Geek Vape thought ahead and included an adapter for a standard 510 drip tip with this kit. I’m not a fan of the over sized included drip tip. Here is the standard specification list for the Griffin 25 RTA with top airflow. 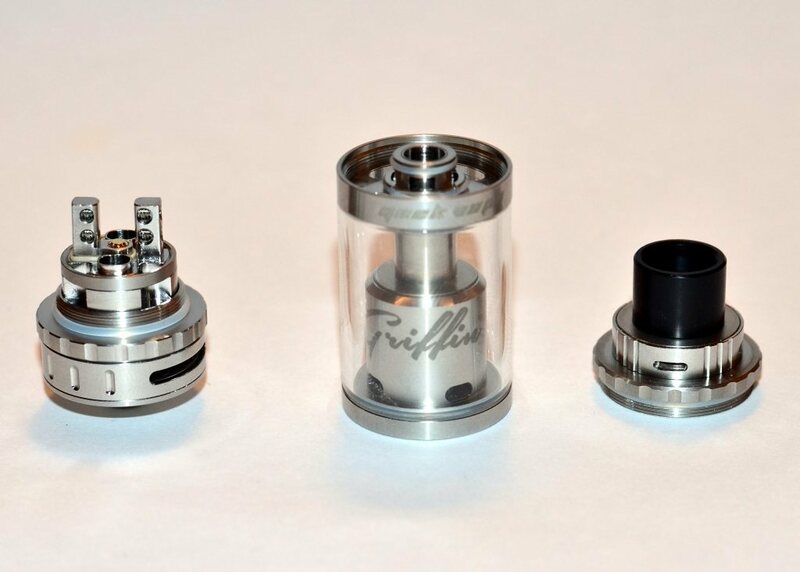 Note that the specifications are slightly different for the standard Griffin 25 RTA, The standard will hold 6.2 ml of juice versus 6, and is slightly taller as well. The Griffin 25 RTA is my first tank with a velocity style build deck, all of my other tanks are either the traditional design made popular by the original Kanger build deck or the Kayfun style decks. That said, some of my observations are very likely to be a result of adapting to the new style build deck. Building on the 17mm velocity build deck is a dream. 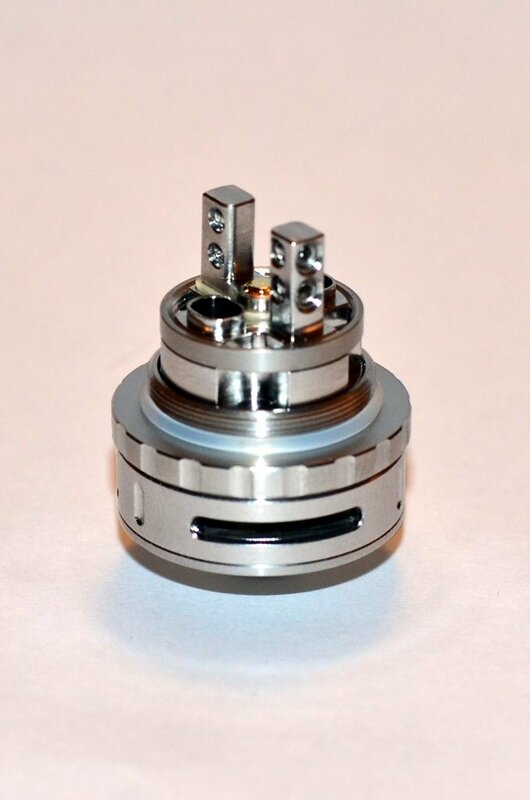 With 4 holes between the 2 posts, It is easy to build single, dual, or quad coil builds with the Griffin 25 RTA. While I am not a fan of allen head set screws, I have to say that they are necessary for this type of a build deck, as they have to go into the post far enough to keep from shorting out against the side of the chimney. The included three sided tool makes it easy to adjust and use the set screws. The 2mm holes in the post are large enough for Clapton coils, not to mention almost any standard gauge wire to be used as a coil. I had no trouble with installing my test coils in the build deck, the set screws are short enough that they didn’t come anywhere close to the chimney once everything was properly assembled. Wicking this new style build deck was quite an experience. I lost a lot of juice to leaking, but that is all on me, not the fault of the Griffin 25 RTA. I’ll go into this in more detail below in the performance portion of this review. Once I got it up and running well, the flavor produced by this tank was exceptional in my daily usage. The build that works best for me is a standard 26 gauge, 5 wrap, SS-316L, 3mm internal diameter, spaced coil, which comes out to approximately .45 ohm. This is an awesome build that will allow me to test temperature control AND power mode without needing different builds. Also, being lazy, it will allow me to pull the cotton out, dry burn it clean, and rewick it quickly, which is much easier (even with this large build deck) then rebuilding it every couple weeks. As I am not a cloud chaser, I used the single coil adapter with great success. In my daily rotation, with 3 other tanks, a single fill of 6ml lasts a very long time, I can usually go a day and a half (sometimes two) before I need to refill the Griffin 25 RTA. I don’t usually talk about juice, since everyone has different tastes, but I am a huge fan of Jimmy the Juiceman’s “Peachy Strawberry” flavor. It has been one of my daily vapes for over a year and I have yet to find a tank that makes it taste bad, but this is the first time that I was astounded by just how GOOD it tasted. The flavor produced by the Griffin 25 RTA is spectacular. I was so surprised at just how much flavor I got from my juice that I asked my local shop owner (where I buy it) to taste it in the Griffin 25. Thankfully I had filled the tank before I went in, because before I knew it my mod was being passed around the shop for everyone to see just how dramatic the flavor was. I suspect they sold a few of these tanks that day. As promised above, the biggest problem I had was wicking this thing. I already mentioned this is my first velocity style build deck, so I did quite a bit of research to find the best way to build and wick it. In my research I came across a multitude of different ways to “properly” wick the Griffin RTA for optimal performance, but none of them worked for me. I tried cotton with diagonal taper cuts, cutting the wick short to the deck base, and several other techniques, all with no success. Every single wick resulted in huge leaking problems. I lost over 20ml of juice to the leaking and finally, out of frustration, I ended up just stuffing the cotton all the way into the juice channels. I should have tried this first … sigh … It turns out that the best ways to wick the original Griffin 22mm tank do not work well with the new 25 RTA due to the larger juice channels. Once I figured this out, the hardest part was getting the Rayon (I prefer it over cotton for the pure flavor it produces) into the juice channels in a way that I could still tighten down the ring that holds the wick in place. Once I figured out just how to properly wick the Griffin 25, I filled it with juice and started testing the limits of this tank. In Power mode on my mods, the top airflow turned out to be fantastic. Settings that would normally be too hot for my liking were much more enjoyable. With the airflow wide open at the top and the bottom, I had no issues with using the tank. The wicking was beautiful at higher wattages, and I suffered no dry hits, the flow of juice through the large channels easily kept up with me. The Griffin 25 RTA produced exceptional clouds and great flavor in this configuration. Switching over to Temperature Control mode on my mod resulted in very different results. I thought I had everything perfect from my test results in Power mode, however, after switching over I started having leaking problems again. My first thought was the wicking wasn’t right, but that didn’t make any sense since it worked beautifully in Power mode with no signs of a single leak, so I decided to try changing the airflow adjusters before rebuilding the Griffin again. I left the top airflow wide open and started adjusting the airflow at the base. No matter which of the 4 positions I set the airflow at, I still had big problems with leaking. I also figured out that if the bottom airflow was completely shut off and the top was open, the drip tip and double walled chimney acted like a straw. After a mouthful of juice, I opened up the bottom again and started playing with the top airflow ring. Eventually I figured out that If the top airflow was approximately 25 percent open, the leaking stopped. More than that and the Griffin 25 RTA would leak like a sieve. Ultimately, after a couple of days playing around with the airflow rings, I figured out that my ideal settings were to have the bottom airflow ring adjusted to about 75 percent and the top fully closed to get the best flavor out of my juice with zero leaking. To sum this review up, at 25mm the Geek Vape Griffin 25 RTA is a large 6ml tank and really needs a large mod to go on top and not look over sized. On top of my eVic VTC Mini, it makes the mod very top heavy and looks kind of ridiculous (still works great though). Looks aside, the velocity style deck is quite large and a pure dream to build on. You can build a dual coil setup on it with ease, but if you prefer a single coil, there is an adapter provided with the tank for single coil builds. The over sized drip tip was too large for my personal tastes, however there is a standard 510 drip tip adapter included in the package which allowed me to use my preferred friction fit style drip tip. 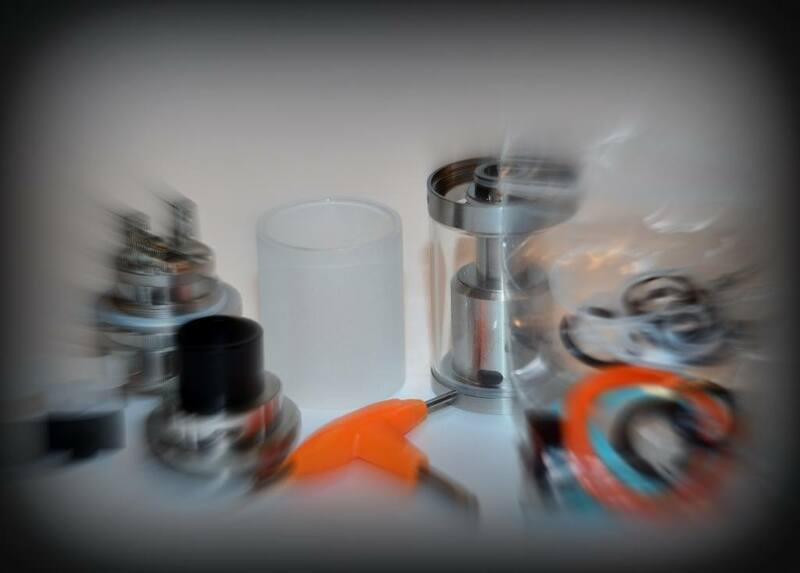 If you already own the 22mm Griffin, FORGET everything you know about wicking it, otherwise you will have leaking problems with the Griffin 25 RTA. 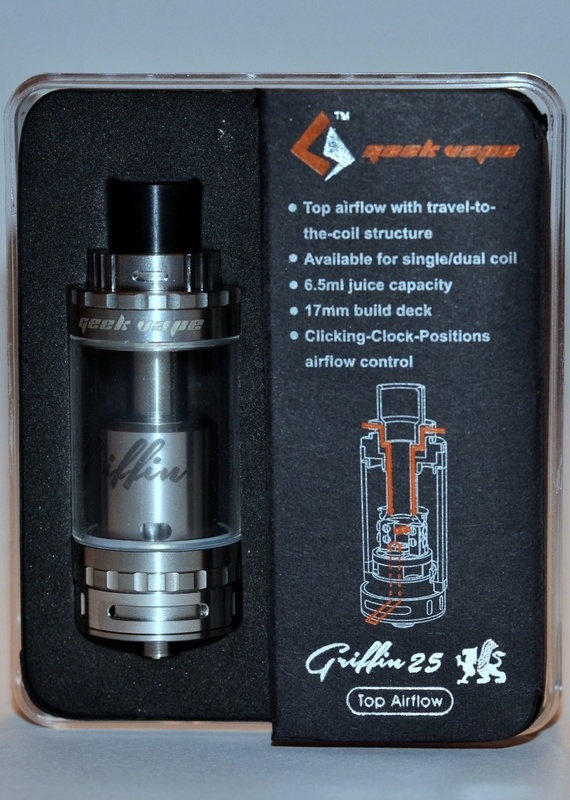 As for the bottom line, if you are relatively comfortable with wrapping your own coils and doing your own builds, then the Griffin 25 RTA is probably for you. Being lazy (as I already mentioned above), the 6ml tank is ideal for me, as I don’t have to fill it nearly as often as any of my other tanks. If, on the other hand, you are a new vaper, and are not comfortable with wrapping your own coils or doing your own builds, then I would have to recommend against this tank. While it is very easy to build on, there are no pre-built coils for this “tank” like there are for almost any other “sub tank” on the market, like the Kanger, Joyetech, Innokin, Uwell, Aspire, etc. Of course if you are coming from a standard tank and are ready to start experimenting with your own builds, you will be hard pressed to find a build deck this large to work with.